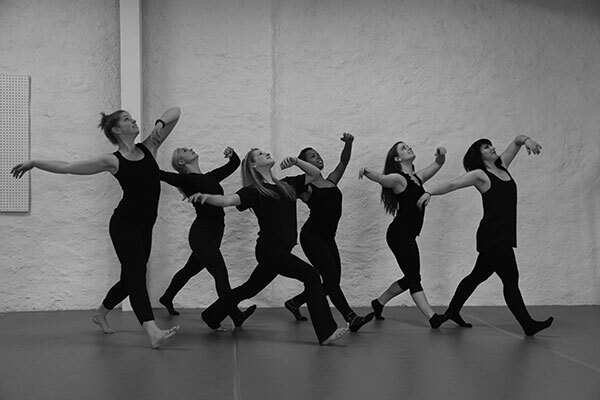 Dancer-choreographer Alison Liney is in her first year residency with MM2’s choreographic collective. Late last winter, Liney was in the studio with the dancers contemplating the final section on ‘Expel‘, her debut piece with the company. Liney cued up the music on her iPod, moving closer to the dancers, and then zeroed in on spatial adjustments of dancer body capes and group sculpturing. Between segments, Alison explains that she usually creates a dance piece working from “a blurry skeleton. I almost always have the movement in my head, but the staging changes. When the dancers start executing the choreography, I try to be as flexible in the development as possible,” preferring to mold her movements from real time interaction with the dancers. As a dancer Liney started comparatively late, she said, than many dancers and not thinking at all about creating choreography. “I was in gymnastics first, and then stopped in high school. I took a ballet class and was immediately hooked,” she recalls. “I think I just grew out of gymnastics and those positions felt so severe, a lot less natural to me than dancing,“ Liney observes. ‘Expel’ has the quality of both abstraction and telling individual stories. Liney cites specific inspirations she used from literature, including quotes from Sylvia Plath’s shattering autobiographical novel “The Bell Jar” and another from “Looking For Alaska”, the popular youth novel by John Green. That balance between dancer and choreographer, Liney admits, can feel “overwhelming sometimes and hard to balance. Right now I prefer performing over choreographing because I feel stronger as a dancer. I feel like I’m developing and exploring both realms. Actually, this was the reason why I was so pulled to MM2. They provide an opportunity to younger choreographers and this was very exciting to me,” she said. Lewis Whittington’s articles on the performing arts have appeared in several print and online publications including The Philadelphia Inquirer, The Dance Journal, The Advocate, Dance Magazine, American Theatre Magazine, Playbill and Stage Directions.